But back to the future workforce thingie: While not exactly a superpower per se, the Estipona Group recently launched two new websites for Nevada state agencies that serve that goal, ultimately helping job seekers develop rewarding careers. The Nevada STEM Hub was created for the Governor’s Office of Science, Innovation and Technology, and Career Path Nevada was built for the Nevada System of Higher Education. 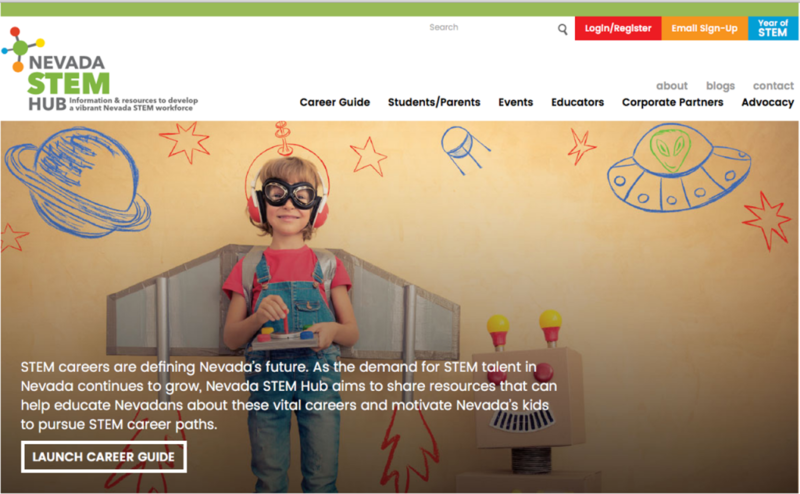 The Nevada STEM Hub website helps students, parents, educators, and area businesses better understand STEM (Science, Technology, Engineering and Math) and the opportunities a STEM education offers. In addition to the website, the Estipona Group created a Nevada STEM Hub identity package and collateral materials. Career Path Nevada was commissioned by the Nevada System of Higher Education to provide a simple, interactive way to explore complex state career education data. Translation: We were asked to make potentially boring and wonkish info, primarily presented in spreadsheets and graphs, into something interactive, interesting and useful. In keeping with the goal, Estipona Group designers and programmers developed an animated report that offers career data based on hundreds of different academic areas of study. Estipona Group founder Edward (wait for it) Estipona said this kind of work falls in line with the agency’s mission. He says efforts that support education and help our state better prepare for a prosperous future are ideal projects for the Estipona Group. Want us to superpower your website? Send us a request. Or use the Bat Signal. That works, too.